I can share this with you now because she has received mine too. We signed up for the swap that Marsha (sassy mini dolls) had! I can't wait to see on Dec.1 the Virtual Tree that Marsha is going to share with all of the ornaments that were sent. Should be great fun to see them all!! Here is my ornament which is so detailed and wonderful!! Thank you again Linda!! Patty, it is really beautiful!! Que maravilla, es perfecto, me encanta!!!! 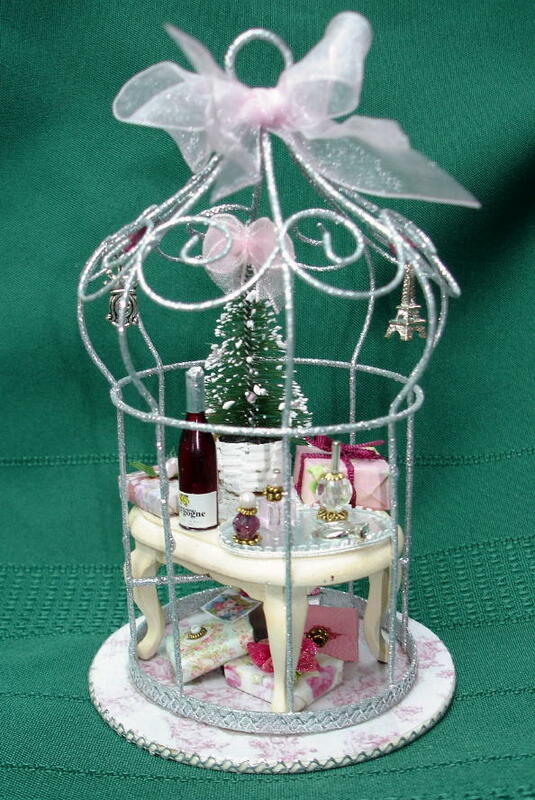 Thank you Linda....It is so wonderful in person and is about 6 or 7 inches tall! Thanks for all of the comments ladies! I have more to share soon. I have had the roughest week with an awful cold!! Zapped me out! I never get sick. I Love the ornament!! So pretty. What a wonderful ornament you received from Linda! I know she's thrilled with the beautiful baby you sent her! I hope you're feeling better real soon. That's a wonderful keepsake from Linda! This is adorable!! !Was it all hand made, the wire part of it? Thank you very much for taking part in my blog candy raffle and for your nice comment. I'm really enjoying looking at all the peoples blogs, that were involved in the exchange and seeing what Ornaments they sent and received. What a beautiful ornament with such amazing detail. I clicked on the picture to take a closer look.